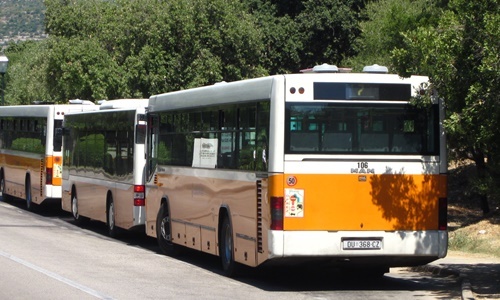 Libertas Dubrovnik bus line 7 runs from main bus station which is situated in port area via Montovjerna and Lapad to Babin Kuk. It is convenient for those tourists arriving to main bus station or Dubrovnik airport (airport shuttle bus arrives to main bus station) and staying in the neighbhourhood of Lapad or Babin Kuk. This line is also convenient for those who stays at these two neighbourhoods and wants to take ferries departing from Gruz port. By using this bus line you can also reach Cava and Copacabana beaches. Bus line 7 runs from early morning to evening, every hour. Check out below bus stops on this route. Check out the latest bus timetable here. Libertas bus line 5 departs from Kantafig stop which is situated next to the main bus station in Gruz. This bus station is the place where all buses to Dubrovnik arrive as well as Dubrovnik airport shuttle bus. You will find here also taxi stand with taxis 24/7. 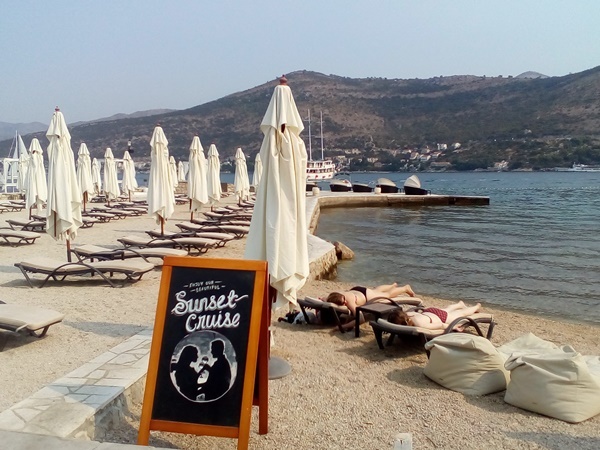 This bus stop is situated just opposite Hotel Petka and next to embarkation pier for ferries and catamarans that sail from Dubrovnik (Bari, Elaphite islands, Mljet, Korcula, Hvar, Brac, Split). This bus stop is situated opposite Green market in Gruz. In this area you will find department store, pharmacy, tourist agencies, exchange offices, bakeries, shops etc. This bus stop is situated behind Minceta department store. Only few steps from there you will find several shopping centres, supermarkets, newspaper agents, banks etc. This bus stop is situated near Dubrovnik Court and Police station. Only a few minutes from this bus stop there is 5-star Hotel Bellevue. This bus stop is situated only a few steps from 4-star Hotel Lero and a short walk from 5-star Rixos Libertas Hotel. This bus stop is situated in Lapad area close to traffic lights and only a 5-minute walk from 3-star Hotel Ivka. Dubrovnik Hospital is located only a short walk from this bus stop. This bus stop is situated in the touristic area of Lapad near Lapad promenade and close to Lapad beaches. From here you can easily reach following hotels: Hotel Adriatic, Hotel Aquarius, Hotel Dubrovnik, Hotel Komodor, Hotel Kompas, Grand Hotel Park, Hotel Perla, Hotel Sumratin, Hotel Uvala and Hotel Zagreb. In this areas there are numerous apartments, hostels and guesthouses. This bus stop is situated in the vicinity of Auto Camp Solitudo - the only camp in Dubrovnik. This bus stop is situated only a short walk from 4-star Valamar Lacroma Hotel and 3-star Tirena Sunny Hotel. This bus stop is final stop of bus line 5 and is situated close to 5-star Valamar Collection Dubrovnik President Hotel. In the vicinity you will find also Importanne Resort with its five hotels: 4-star Hotel Neptun, 5-star Hotel Ariston, 5-star Royal Palm Hotel, 5-star Royal Princess Hotel and 5-star Royal Blue Hotel. From this stop you can reach both Cava and Copacabana beaches by walking through Babin Kuk park. This bus stop is situated close to Post Office Lapad and only a short walk from Lapad promenade. This tourists area is dotted with restaurants, cafés, beaches, apartments and hotels. In the near vicinity of this bus stop you will find Hotel Lero. Only a short walk from here there is Rixos Libertas Hotel. This bus stop is situated near Hotel Bellevue. This bus stop is situated in the downtown of Dubrovnik where you will find numerous banks, shopping malls, supermarkets, bakeries, Post Office, pharmacy etc. This bus stop is situated in front of Srdj department store and close to Green market in Gruz. In this area you will find numerous shops, restaurants, cafés, tourist agencies, rent a car offices, exchange office etc. Only a short walk from this bus stop you can reach embarkation point of all ferries and catamarans departing from Dubrovnik. This bus stop if the final destination of bus line 7. It is situated next to main bus station and cruise port area.